Joseph Guardarrama, an attorney who lives in West Hollywood and has been active in civic affairs, has been named by Los Angeles Business Journal as one of the “Most Influential Minority Lawyers” in the L.A. region. 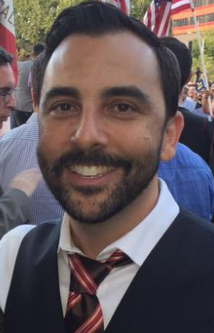 Guardarrama, who is with the Kaufman Legal Group, brings “a unique blend of private practice experience and service as a public official to the firm’s Governmental Ethics, Campaign Finance, and Election Law practices” said an announcement by L.A. Business Journal. Kaufman Legal Group specializes in legal services connected to the political process, serving clients such as elected officials, PACs, business groups and labor unions. In his current position, Guardarrama advises candidates, officeholders, political action committees, independent expenditure committees, major donors, lobbyists and corporations regarding all legal aspects of their involvement with the political process at the state and local levels. Guardarrama also sits on the City of West Hollywood’s Ethics Reform Task Force, which has brought forth several recommendations approved by the City Council to improve regulations involving campaign contributions, lobbyists and transparency. Guardarrama served on the city Planning Commission for more than seven years, presiding over Commission meetings as both chair and vice chair. In that role he dealt with complicated land use policy matters such as the creation of a new general plan, the Red Building expansion of the Pacific Design Center and multiple affordable housing developments. Guardarrama also served as a business license commissioner and on the city’s Campaign Finance Reform Committee. Congratulations to my friend, Joe Guardarrama! You are a shining example for proving that hard work, passion, commitment and honor pay off in private life, the professional world and in public service. Guardarrama made a huge contribution as part of the City’s ethics panel to put teeth into ethic reform. Joe is a credit to West Hollywood. An interesting read. What is even more interesting is a read through Mr. Guardarrama’s campaign contributions from 2015. Virtual wallpaper reflecting players involved in ministrations while functioning as a planning commissioner for seven years. One would think that with a successful law practice, one could have self financed a campaign much as has been accomplished by Lauren Meister. Instead there is a cavalcade of lobbyists, their wives, developers and their family members which provides a unique picture. There is also the ever present unmentionable donor skunk at the picnic. Ethics 101 is walking one’s talk. Joe Guardarrama would have been an extraordinary councilmember and to hope he has the desire to run for our West Hollywood City Council. Congratulations Joe on all your accomplishment and recognition. Well deserved!